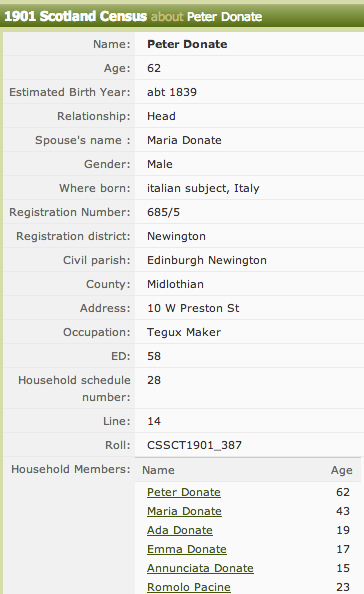 Agostino Donati, brother of our 2nd great uncle, was one of the Italian pioneers who were first to settle in Scotland. His family were masters in the art of Stucco and were one of the first families to make a living from this in the Edinburgh region. The couple were married in the year 1880 in Tuscany. Their decision to move to Scotland must have been instantanious. 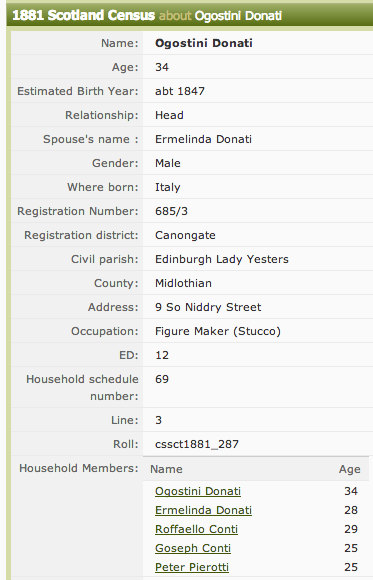 We find them in the 1881 census living in Niddry Street, just off the Royal Mile with their two cousins Joe and Gostini Conti and another cousin Peter Pieroti. Their occupations all given as Stucco Plasterers. How long they lived in Scotland before finally settling here is not known to us as their two children were both born in Italy. The family however settled up the north of Scotland in Inverness where they had a business, eventually moving from Stucco to confectionery and they even ran a boarding house at one time. They adoped Biagio Candellini who was orphaned at an early age and was ‘adopted’ into the Donati family where he was raised. He helped in the shop in Inverness helping his adoptive parents with the running of the family business. When he became of an age he started his own shop but always remained close to the family. He returned to Italy where he died in retirement. Romolo Donati, daughter of Agostino and Ermelinda. Their natural born children were Ornero Donati who was born in 1886 in Italy. There has been another exciting find in this branch of the Donati family. We have heard from a descendant of Pietro Donati who was also born in Coreglia in Lucca. The dates and names confirm that these two, Antonio and Pietro were brothers from Coreglia. As you can read below this branch of the family ended up in Canada where Pietro plied his trade as the master of stucco and where he could create beautiful works of art as a sculptor. He has many works in the Churches in Quebec. Pietro had a daughter called Virginia Donati and she married a French Canadian called Thomas Bedard. They had a little girl Eugene who died when she was only one. 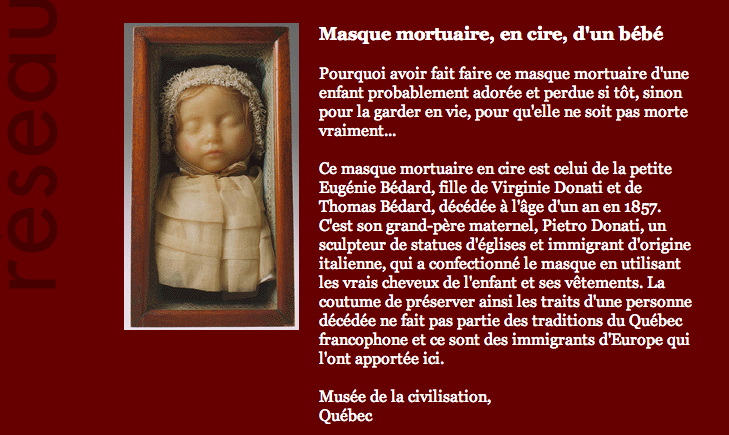 Pietro, the grieving grandfather made this mask which is in the Museum of Quebec. 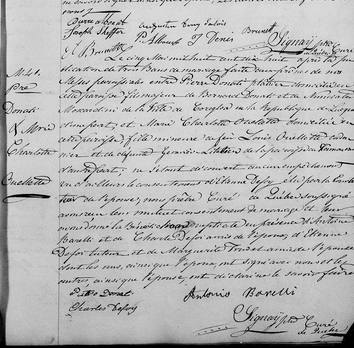 Archives showing that our Pietro Donati was also born in Corelglia in Lucca. 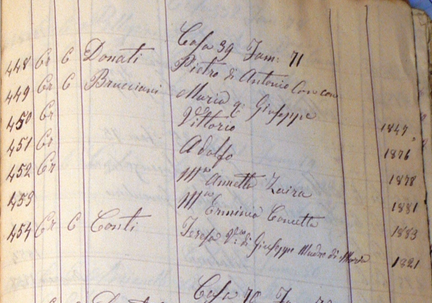 Pietro married Maria Brucciani and their children are listed above. 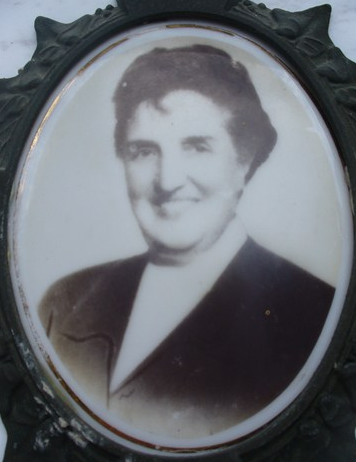 Teresa Conti was Maria's mother. Two sisters Brucciani. One marry into the Donati Clan and the other the Dante's. 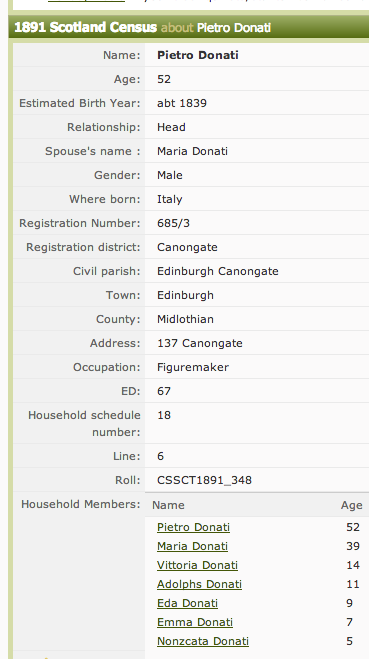 My three times great grand father’s name was Pietro Donati. He came to Canada from Coreglia, Lucca, Toscany in the early 1800s. He was also a plasterer. He made statues for churches. I find it really interesting that your family are Donatis, from the same region of Italy and have the same occupation, which makes me believe that it was probably a family trade of all the Donatis from Lucca. There would be a strong possibility that these branches were connected with the same name being carried down throughout the years. Our Pietro’s father was Antonio and he also came from Coreglia, Lucca. So we can presume that these two were brothers. I have inserted a document from the archives that will confirm this. Please look above. I would love to hear more about your line and perhaps dedicate a page to your ancestor. Please e.mail me direct on quilietti@blueyonder.co.uk. I will now look at the museum archives. 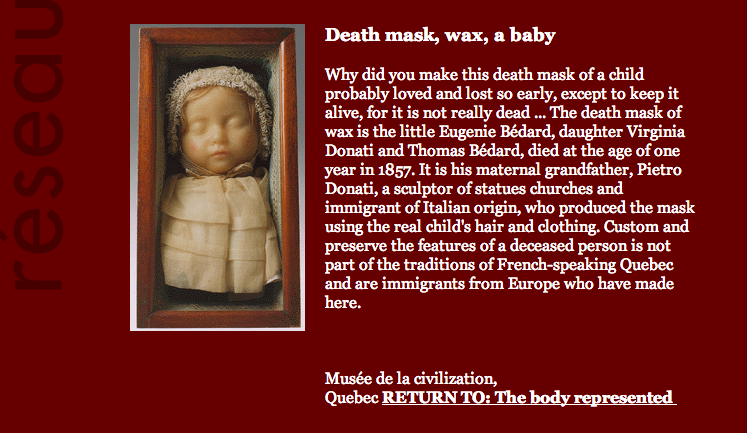 This page is a great find for me, especially with the picture of the wax mask of the baby. 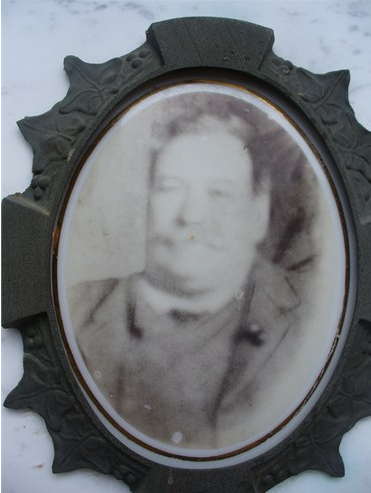 I have been researching the family line of Pietro Donati, the great-grand father of my great-father on my mother’s side. 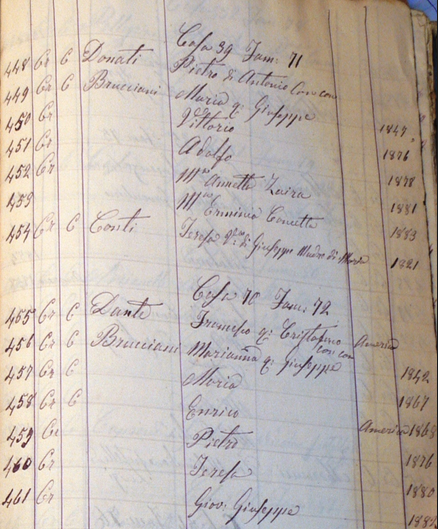 On this page you say he was born in 1847 and was the brother of Antonio – I believe he was another Pietro. Pietro Donati (the sculptor) from Coreglia Antelminelli was born around 1787. I believe this because in the 1818 census in Quebec City it says he was 31 years old. He was married to Marie-Charlotte Ouellette and they had a daughter named Viriginie. I think Pietro Donati came to Quebec City around the year 1815. His parents names were Bernardo Donati and Nunciata Moscardini. They were probably born around the years 1755-1760, but I cannot find any information on them. 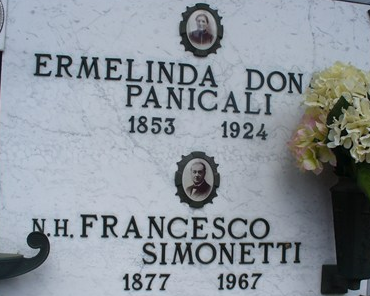 I also found information on Bernardo Donati (father of Pietro) that says his father’s name was Antonio and his mother was Francesca Gonella – they would be Pietro’s grandparents (I put their birth dates around the year 1735). So as you can see, I have found information that goes way back. I have just come back from a trip to Italy with my mother, and we visited the village of Coreglia Antelminelli. It was amazing. Let’s keep in touch. We’ll have lots to share. Hi Nancy we are from the same Donati Branch. My ancestor was Pietro Donati married to Charlotte Ouellette, he was the son of Bernardo Donati and Nunciata Moscardini. He was born around 1783 in Corégila Italy. 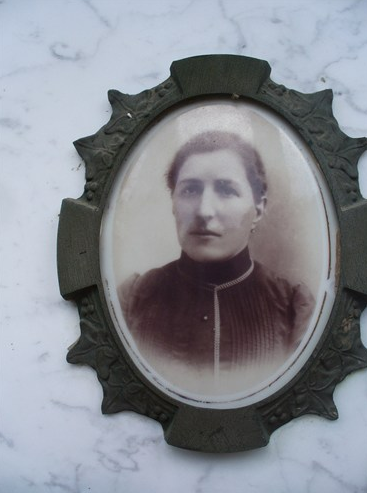 My mom is the daughter of Marguerite Donati who was the daughter of Francois-Noel Donati married with Carmelice Légaé, and he was the son of Pierro Donati married to Adelaide Dumontier. Pierro was the son of Pietro Donati and Charlotte Ouellette.